When I returned to the USA in 1991, it used to be a GREAT thing when Americans discovered that I was Nigerian. There would be an initial pause followed by, “Oh my friend, neighbor, brother-in-law, sister-in-law etc is Nigerian.” What would follow would be subsequent positive encounters and dealings with Nigerians: their intelligence, hard-work etc. Over time, that has changed. Now, I get, “Oh, you are Nigerian. Isn’t that where they are constantly scamming people.” Apparently most Americans saw the 60minute feature on the “mugus” that fall at the hands of Nigerian 419 scammers.This is followed by a sympathetic “I feel your pain” comments to me as I am subjected to questions about Christian v Muslim conflicts, corruption etc. 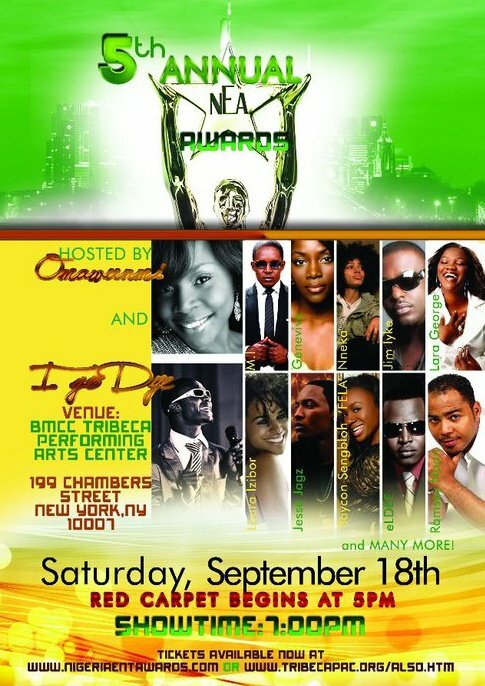 I am excited to tell you I will be the official host on the red carpet at the 2010 Nigeria Entertainment Awards (NEA) to be held in New York City. The NEA celebrates and recognizes the achievements of Nigerians in the fashion and entertainment field, globally. I hope you plan on attending as I introduce and you get to meet some phenomenal Nigerian fashion and entertainment personalities who dispel the negative images of Nigerians that is now common place in America. For example, meet Laura Izibor (Nigerian/Irish) who is making waves worldwide with her music, Nollywood actress Genevieve Nnaji featured on Oprah, Nneka who is proudly Nigerian and appeared on the Jay Leno show and 2010 BET nominated rapper MI, among many. Read the press release below and hope to see you there!